The striped pig, which represents all drinking men, is ridden by a skeleton (the grim reaper) brandishing a sharp scythe in his hand and stampeding around within a large pigpen. The pig's hind feet are standing upon the Holy Bible and a book labeled Statutes. He appears to be trampling a mother and her child. Next to the fallen mother and child are boxes labeled American Temperance Union, Temperance Tracts, Sargents Tales, and Beechers Sermons. A list entitled Deaths by Intemperance also lies opened on the ground. Onlookers gather outside of the fence enclosing the pig. They are poking the striped pig with wooden planks marked Moral suasian and Prohibitory Law, but seem to have no effect on the pig's violent behavior. One man observes, "I tho't this would have brot him up but he snaps it like a reed." Men in various stages of drunkenness and dismemberment are sprawled out on the ground in the pigpen. They are obviously exhibiting the effects of the striped pig's rampage. One end of the pen is bordered by a shop offering rum and gin from bottles on the bar. A sign hanging over the shop reads Dedham Sty—referring to the pigsty that is the stage for the drama unfolding in the cartoon. A customer dressed in rags stands drinking at the bar. In his hand he holds a folded paper labeled Liberal. From a window overlooking the bar the devil surveys the scene and remarks: "Go it Striped! You are the best servant I ever sent into the field." The wall bordering the pigpen on the right side of the cartoon is made up of large stone block marked Spirit of the Age, Religion, Common Sense, Reason, Parental Affection, General Education, Love, and Truth, among others. One of the observers outside of the pen remarks to his worried friend: "Give yourself no uneasiness, he'll fetch up at the wall," meaning that the wall's composition of such strong moral building blocks will certainly stop the pig's progress. In the right background of the cartoon is the capitol building over which a flag flies, labeled Law of 1838. On April 19, 1838, the state of Massachusetts passed a law that attempted to curtail the use of alcohol by requiring that all retail sales of liquor be in quantities of 15 gallons. Retail shop owners constantly ignored the law or thought of creative schemes to circumvent the law in order to maintain their business in the liquor trade. Go it, Stripes. You are the best servant I ever sent into the field. I must do something to support my family, but these fanatics would rob me of my right. I keep a respectable house of refreshment & such houses "are indispensable to the welfare of the community." As to making free with my customers pockets, why if I did not do it, somebody else would, so there's not harm in that. I tho't this would have bro't him up but he snaps it like a reed. Hurra! He goes over the courts in spite of all opposition! What a ferocious monster. Who'd have thought he could have broken so strong a barrier as this? I like this "Critter" better than my pale horse. "What a curse!" cannot something be done to stop him? It is sad work, to be sure, but then we must take care of our party. I fear the progress of this monster will not easily be checked. Give yourself no uneasiness. He'll fetch up at the wall. Enterred according to Act of Congress in the year 1839 by Charles Jewett in the Clerk's Office of the District Court of Rhode Island. 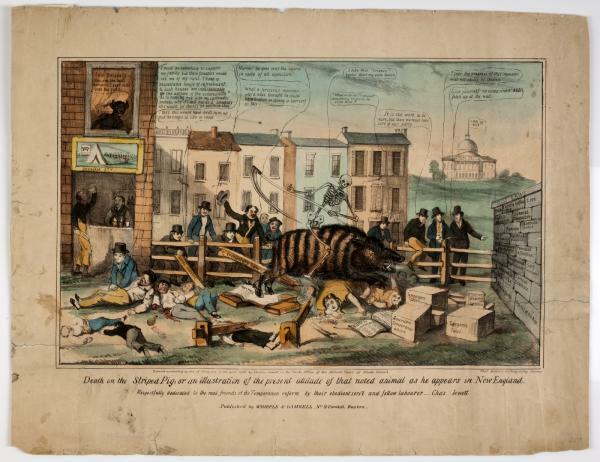 Death on the Striped Pig, or an illustration of the present attitude of that noted animal as he appears in New England. Exact Title: Death on the striped pig, or, An illustration of the present attitude of that noted animal as he appears to New England. Dimensions: 24.8 x 39 cm.